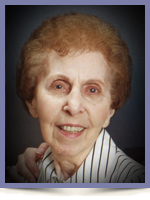 ALBANY – Marie L. Bondi, 89, of Albany, died Sunday, May 10, 2009 in the Hospice Inn at St. Peter’s Hospital. Mrs. Bondi was born in Youngstown, OH, but lived in the Capital District since she was a young girl. She was a graduate of Bethlehem High School, and was employed by the New York Telephone Co., Grant’s Dept. Store, and the New York State Division For Youth. She was an avid NY Yankees fan, and a bowler. She bowled in leagues at the ABC and Sunset Lanes. She also was a communicant of St. Margaret Mary’s Church in Albany. Mrs. Bondi was the wife of the late Anthony J. Bondi. She is survived by her son Gerald A. Bondi (Colleen) of Westmere; her daughter Margaret A. Bondi of Latham; her sister in law Lena LaCavera of Ohio; her grandchildren Dr. Stephanie Robinson (Christopher Robinson, M.D.) of Mt. Pleasant, SC, and Bryan Bondi of Hartford, CT; and her great grandchildren C.J. and Aiden Robinson. She was also a special aunt to Gianna and Dominic Aquino, and was predeceased by her parents Frank and Cosima Zuccaro LaCavera, and her siblings Frances Chera, Joseph LaCavera, Jennie LaCavera, Josephine DiNovo, and Charles LaCavera. Funeral services will be held in the Hans Funeral Home, 1088 Western Ave., Albany, Friday morning at 8:15, and from there to St. Margaret Mary’s Church, Homestead St., Albany, at 9:00. Relatives and friends are invited, and may call at the funeral home Thursday from 4-8 p.m. Interment will be in Our Lady of Angels Cemetery, Colonie. Those who wish may make memorial contributions to Community Hospice of Albany, 445 New Karner Rd., Albany, NY 12205. The family would like to thank Richard DiNovo, Elaine Falzano, Marguerite Gregorie, Mary Anne DiNovo, and the late Paul DiNovo, Mrs. Bondi’s wonderful nieces and nephews, for always being there for our mom. Thank you also to Linda Reidlinger and Theresa Aquino for opening their home to our mom; and heartfelt thanks to Gail Toomer of the Eddy, and the nurses and techs at St. Peter’s Hospital on 4 Nolan-Riddle, 4 Gabrilove, and St. Peter’s Hospice for the wonderful care they gave our mom.